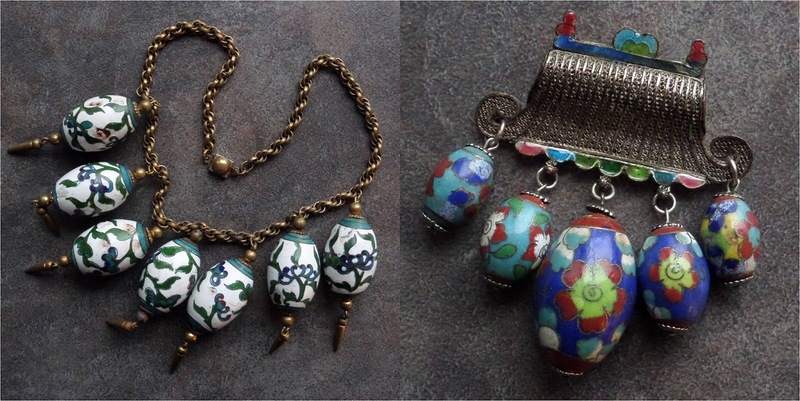 Online auctions often describe Chinese cloisonné beads as dating to the “Deco” era - the years between the end of World War I and the end of World War II (approximately 1920s through 1940s). 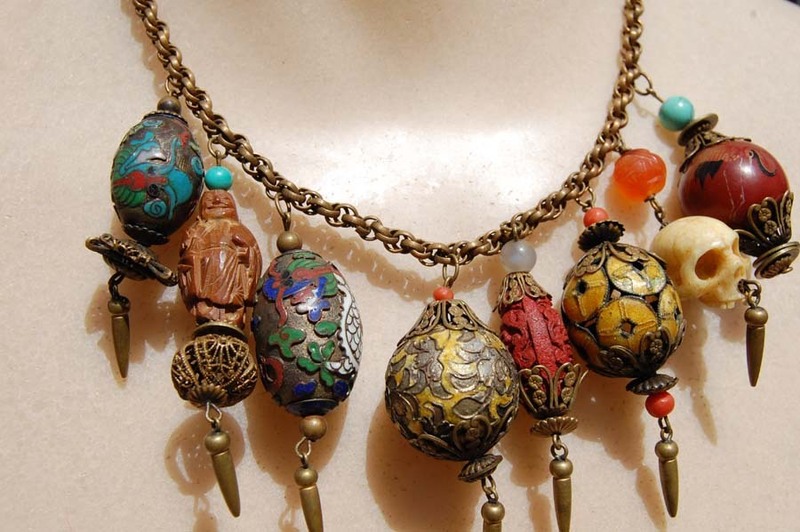 What styles of cloisonné bead are actually characteristic of this period? How does one tell the difference between beads from the 1930s and the 1970s? 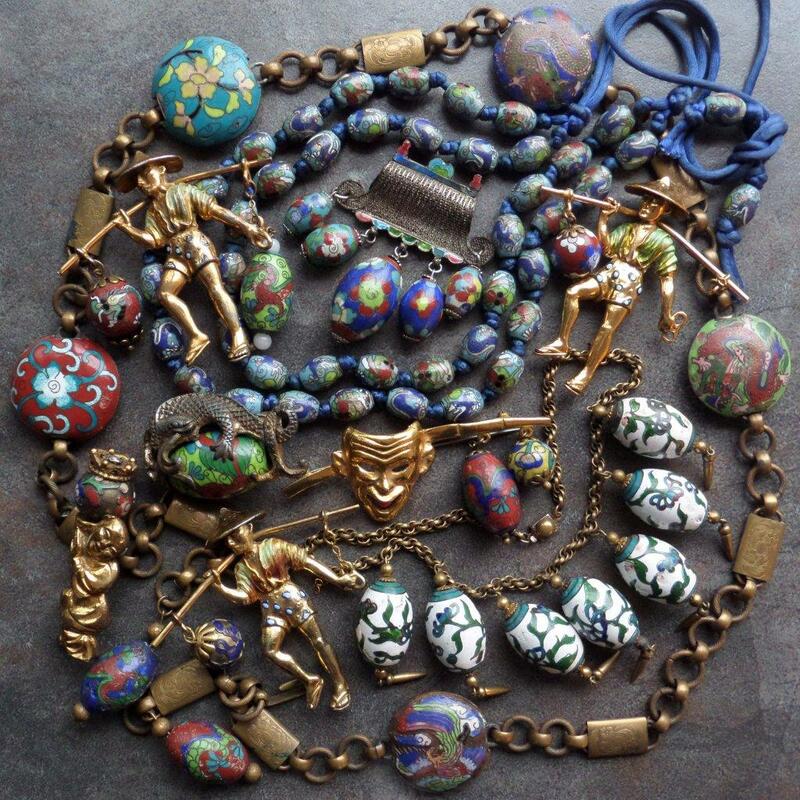 In Robert Liu’s 1995 book Collectible Beads, pages 64 and 65 contain a reference to the collection of Dr. Joan C. Feast (1919-1996), possibly accumulated from 1935 onward and during the years she resided in San Francisco. Here is a link featuring the photo and caption from the book. They are in pretty bad shape. Some sort of repair seems to have been attempted with red and green enamels. The damage to these beads seems typical of their use in designs that caused the beads to swing and clack together, chipping the enamel. 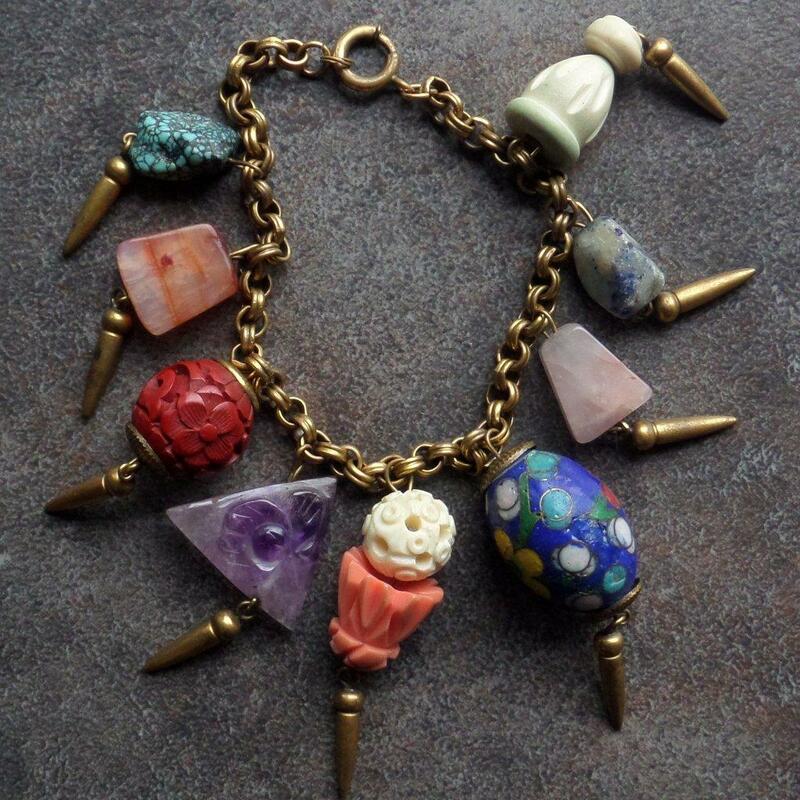 Rich vintage Chinese charm bracelet featuring gemstones and cloisonne courtesy of eBay vendor tikiagogo6058. 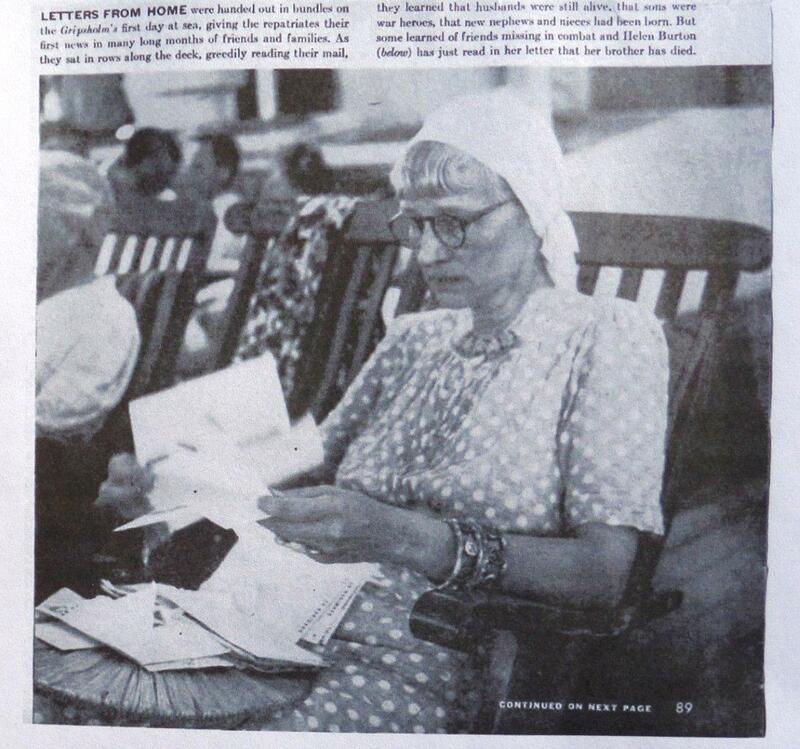 A Life magazine photo of Helen Burton aboard the rescue ship Gripsholm in 1943 shows her wearing a necklace with dangling oval beads, although it’s not possible to tell if they are cloisonné, glass, porcelain, or stone. She had spent the two years prior to this photo in a prison camp, so her necklace almost certainly dates from before the early 40s, and may have been a design she sold in her Camel Bell shop. Some of the disc beads from the photo in Dr. Liu’s book have turned up in brass link belts, and the oval dragon beads appear in jewelry designs by Louis C. Mark and (probably) the Miriam Haskell studio dating to the early 1940s. Courtesy of eBay vendor oncillakat. 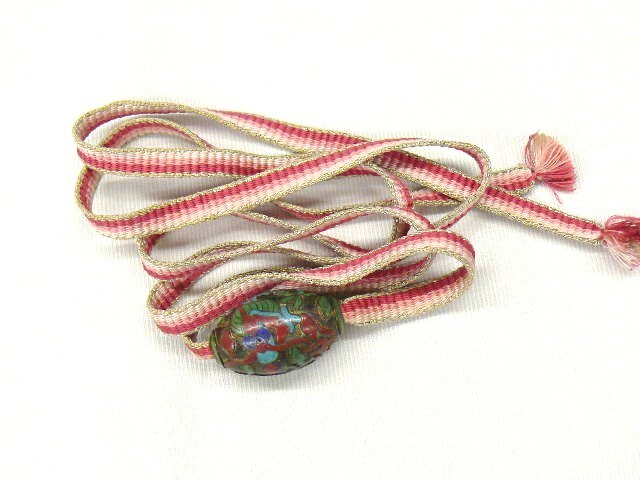 Online auctions from Japan have listed dragon beads as kanzashi and sagemono, and TokyoJinja's lovely blog features a photo of a phoenix disc bead and two dragon beads in use on vintage obidome. A 1930s-1940s time frame for the beads coincides with the period when Japan was active in China, setting up businesses, and - unfortunately - engaging in military incursions. Obidome courtesy of Etsy shop MagicDragon's Store. Could the rectangular holes on many of these disc beads be a holdover from the style of counterweight used in the Qing court necklaces, which required rectangular holes to accommodate the flat cord? The Qing dynasty ended in 1912, so by the late 1930s this style of pendant bead with a rectangular hole would have been 25 years out of production. It seems more likely to me that these beads were created in the 1930s specifically for belts to coordinate with western clothing fashions of the era, as well as obidome and sagemono, and also produced with round holes for costume jewelry fashions then current. The holes of the round and oval beads are large - 4 to 5mm - with rough metal edges. The underlying metal appears to be copper, and is thin – the beads are lightweight. 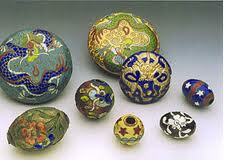 The enamels and general style of the designs on the disc beads can all be matched up with similar round beads. Belt picture courtesy of Etsy shop MagicDragon's Store. Although the dragon beads and discs always display small crinkle clouds or spirals scattered around the background, the floral versions often – but not always - lack these motifs, a feature also observed on export vases that appear to date from the Deco era. Later vases always have their backgrounds filled in, the rows of clouds becoming more uniform and dense as the decades progressed and assembly line manufacture became dominant. Spirals seem to drift out of fashion and disappear after the 1970s. The enamel quality varies from OK to poor, and seems on a par with other small folk art cloisonné articles manufactured during the pre-World War II years, such as napkin rings, condiment sets, cigarette smoking sets with little matchboxes and shallow dishes for ashtrays. The repertoire of enamel colors is pretty basic – red, light green, a darker green, a bright lime green, pink, a light buttery yellow, turquoise and sky blue, royal blue, white, and black. Small holes from gas escaping as the enamel was fired are common. In defense of this limited palette and imperfect surface finish, it can be tricky to create recipes for enamels that will all melt at approximately the same temperature and do not require a separate firing for each and every color. Likewise, the range of minerals available as glass colorants and the fineness to which they must be ground and washed is also a concern for small craft workshops on a budget, especially within the time frame of the global economic depression of the 1930s. Openwork designs without background enamel are common. 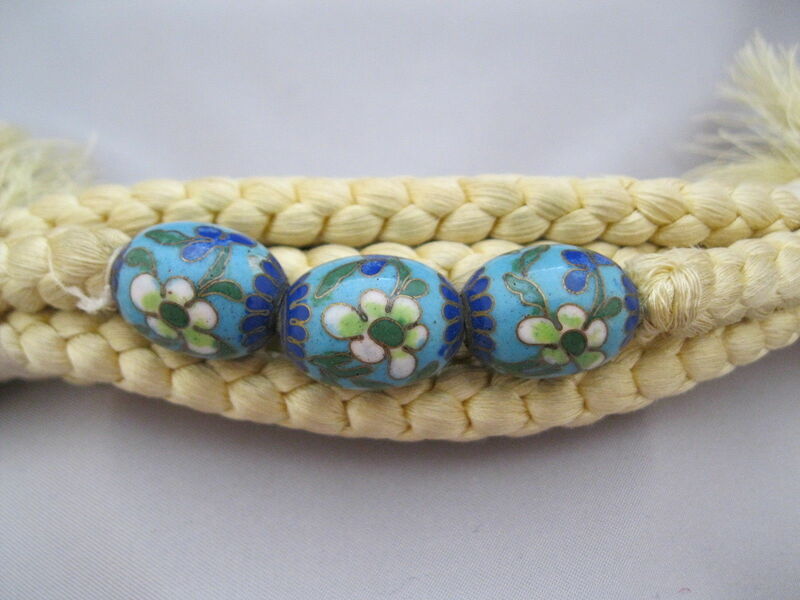 An especially rare bead is one with an intricate and fine floral design done in a sort of reverse openwork - the background is enameled, but the cloisons are left unfilled, and then gilded. A bead of this reverse-openwork type in an extravagant 1930s charm necklace design. Draughtsmanship skills vary from mediocre to artistic. The floral designs are graceful and bold. Oddly, the dragons often only have four toes, which made me wonder if these dragon beads were all the work of one person. 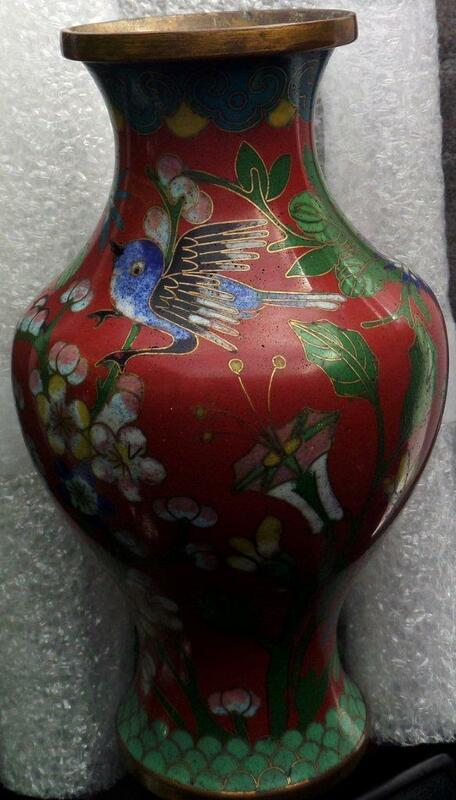 The phoenixes seem especially awkward, even when compared to the charming folk craft style of birds that appear on some of the cloisonné vases made for export during these decades. 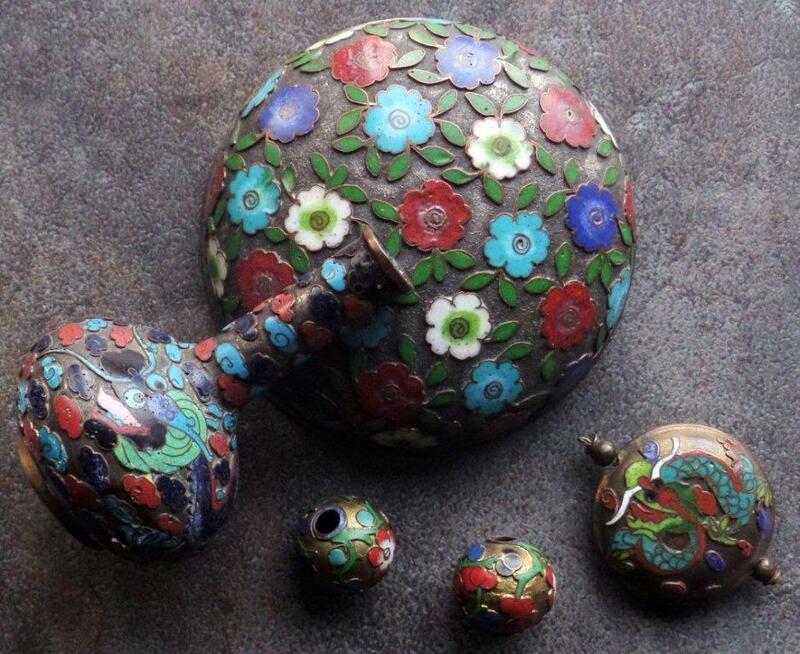 The evidence so far for Chinese cloisonne beads that might actually date from the Deco era is that they’re of comparatively large size, with big holes and comparatively casual workmanship. Their dramatic patterns and size, vibrant colors, and light weight give them considerable appeal, I think. Were these items the product of one cluster of workshops? Were other workshops of this era making finer beads? 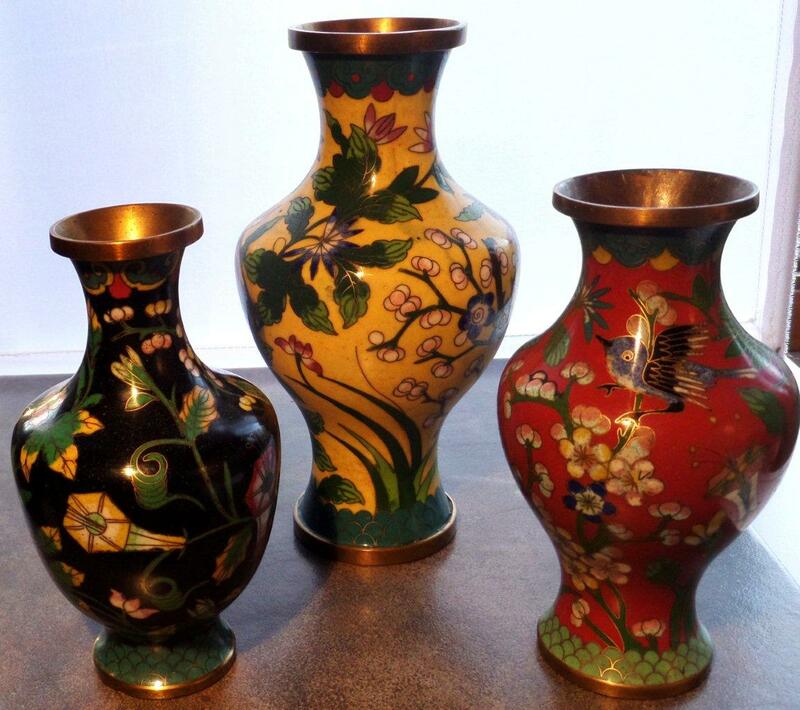 Are all the more skillfully made Chinese cloisonné beads from later decades? 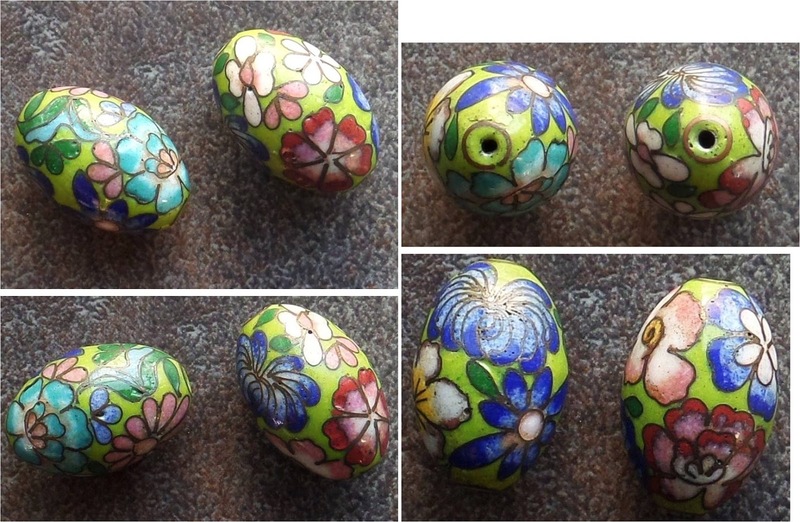 Obidome beads - 1930s or 1970s? 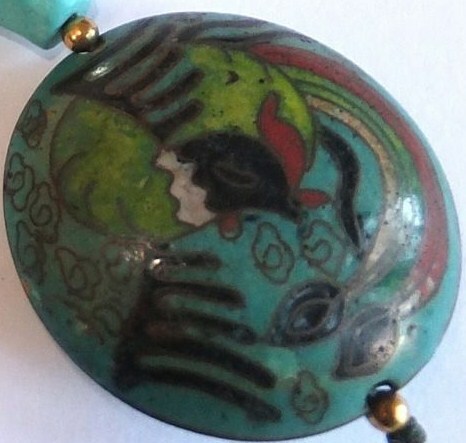 eBay seller wondollar found what seems likely to be a Louis Mark brooch design for Rice-Weiner, featuring a large cloisonne bead about 1 inch in diameter. A Louis Mark brooch with an oriental theme has a patent of 1941, thus it seems probable this bead is Deco era Chinese.